Forklift Operator Job Growth: Commerce, CA – Give the gift that keeps giving this holiday season, a gift filled with future opportunities. Give your special someone a certificate for forklift training and certification! 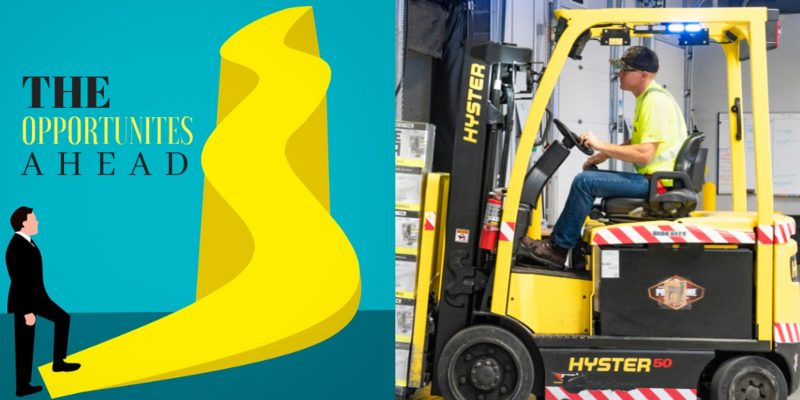 With 2019 upon us and talks about automation, robots, and new OSHA rules in circulation, it’s fair to wonder what the new year has in store for forklift operators. Happily, we have GREAT news! A recent study has been published, stating forklift drivers will see a 3%-4% job growth through 2024 and potentially beyond. Here’s the thing…there may be more robots and automation present in the industry. There may be tighter OSHA regulations. But that said, the United States has over a half-million power industrial truck operators making a successful living as forklift drivers, pallet jack operators, and the like. These jobs are not going away, and in fact, according to the U.S. Bureau of Labor Statistics (BLS), our industry’s job market will continue to grow for the next decade! This is incredible news and proof of all the opportunities yet to come for those obtaining their forklift training and forklift certification. To leverage these opportunities, we can’t stress enough, the importance of obtaining your forklift training and forklift certification from an OSHA compliant program, as the one we offer at American Forklift Training Centers, INC. A program, as ours, will give you the knowledge and hands-on training on how to properly and safely operate a forklift. Additionally, since we take great pride in making sure our students continue to succeed in the industry, we provide job assistance for graduates. Cumulatively, our locations have partnered with 150+ local companies and agencies. Accordingly, rather than hunt for job openings yourself, once you obtain your forklift certification from American Forklift Training Centers, INC., we will send your information out to the companies and agencies hiring in your area. What’s more, we hold regular job fairs catered to forklift positions, thus further opening opportunities for students and graduates. Now, with the job outlook looking strong for forklift operators, the next question is, what industries are growing the fastest? Well, allow us to say one word, “Amazon.” Amazon, the massive online retailer, is estimated to take about 50 percent of the U.S. e-commerce market by year’s end. A company like Amazon, has a strong need for warehouse workers and forklift operators. But Amazon isn’t the only retail company with such demand. Traditional retailers as Target, Wal-Mart, and other online and brick and mortar stores will need folks in your positions to keep their business going! But guess what? Industries outside of retail establishments continue to demand forklift operators as well. Grocery stores, the storage industry, logistics (i.e. FedEx, UPS, Penske, etc…) are growing and they’re growing strong. Accordingly, this means they’ll need more warehouse workers and forklift operators to handle their growth and create smooth processes. Let’s not forget to mention that a job as a forklift operator can grow into such paths as a shipping/receiving supervisor, warehouse supervisor, warehouse manager, distribution manager, operations manager, and more, many of which can lead to six figure salaries. As you can see, a certificate for forklift training and certification is a gift that can keep giving. And…if this is for you…if you’re looking to obtain your forklift training and forklift certification, OR if you’re an employer seeking an affordable, OSHA compliant program, that will quickly train your staff onsite on how to safely and properly operate a forklift, contact us today!